Carol Kelly made the last week before the Christmas vacation a mix of education and holiday fun for her W.O. Hall Magnet Elementary School students. The students learned about poetry, public speaking and technology through reading The Night Before Christmas for a podcast. We at Podango believe that you, our customers, are our most valuable asset. Given this belief, we have always done our best to be honest and forthright in our dealings with you. The current uncertainties of the financial market has affected many of us in this nation. As of this morning, Podango is no longer immune to it’s effects. Our ability to continue operations past the end of this year (2008) is in question. We do not want any of you, or any of your shows to be negatively affected by this uncertainty and so we are encouraging you to begin taking all necessary steps to secure your data or begin moving to another hosting provider. On Monday we will have a more definitive direction. As of today, the last day to move or secure your data is December 31st. RSS feeds will need to be redirected by this date as well. It is our hope that the events of the next few days will allow us to continue providing you a service based upon a subscription fee. Again, we will know more on Monday and you will be notified of any changes to the above plan as soon as we are made aware of them. We do apologize for the short notice during a time when many of you are very busy, and didn’t plan on spending this much time on your shows. We will have a link in the My Podango section of the Podcasters login page by Monday which will allow you to redirect your RSS feed off of the Podango feed to a new feed. Instructions will accompany that tool. Also on Monday we will provide you with alternatives for show hosting. Inactive accounts, those without recent uploads or downloads, may be already been deleted from the system. If you need to contact us, please use info@podango.com. Again I personally apologize for this notice of caution. We truly appreciate your business. Unfortunately they are not giving much notice, for podcasters to move to alternative platforms. Perhaps a reason to manage ones own hosting? Potential podcasting content covers the gamut. With more than millions of podcasts now available, there are few topics that are not covered by this popular communication channel. The runaway success of the iPhone and the rise of the inexpensive, ultraportable laptop netbook and other wireless devices make it clear that we live in a mobile world defined by access to information unbound by location. Mobile is clearly the next frontier for online media, and, therefore, it is also the next step for educational media. Frankly, educational media is already there, to some extent. Podcasting is really the technology that launched mobile educational media, such that countless schools and universities have gone online with thousands of podcasted lectures and classes. Companies that focus on education, such as Apple, Sonic Foundry, and Accordent, have all rolled out tools making podcasting easier. But does making a podcast of a 1-hour lecture for a students iPod really count as mobile media? Rumors coming out of Europe that claim Apple will begin offering unprotected music files from the three largest recording companies on Tuesday are bogus, according to my music-industry sources. The 2008 Podcast Award Winners have been announced. Podcasting is broadcasting on iPods or other MP3 Players. 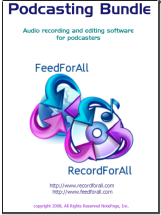 Created by ex MTV host Adam Curry, Podcasting is a new method of communication for the internet - unfortunately, it’s still limited to your PC. But thanks to companies like Apple, creator of the iPod, podcasts can be downloaded to your personal media device and accessed at anytime. Your trusty mp3 player can become a true audiovisual media player - this handy companion is not just for music anymore. It can be tricky to predict what content will perform well on social bookmarking websites. The interests of our democratic populace are widespread and constantly changing. Webpages, podcasts, and images which are deemed more newsworthy, humorous, or intriguing often steal the spotlight. Knowing how to present content on social bookmarking websites can help internet marketers stand out. This podcast is all about information that will help you save money. It is a little bit of the weeks consumer news, plus some tips and advice perfect for the holiday season.